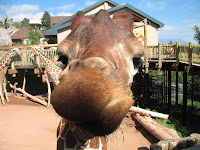 Butterfly Kisses & Elephant Parades: Giraffes! Elephants! Gorillas! My dad had planned on taking Tristan to the zoo today while my shower was going on. 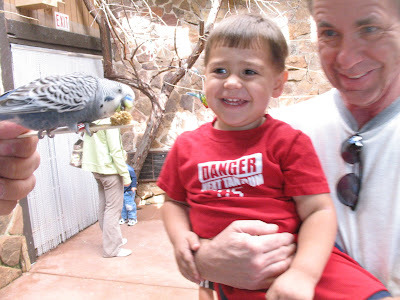 Even though the baby shower was delayed, my dad still wanted to take Tristan to the zoo. With no plans myself, I tagged along. We decided to start the day early and be there at about 9:30am this morning. We didn't finish until about 1:00pm. Tristan is an absolute animal nut. 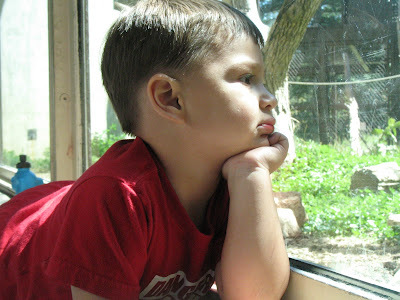 A visit to the zoo and some nice fresh air was what he really, really needed. 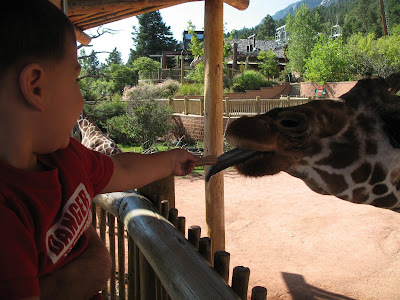 If you've ever been to the Cheyenne Mountain Zoo in Colorado Springs, you would know that it is quite a walk. It is very hilly as it sits along the mountainside. Lots of uphill walking (then downhill the rest of the way if you plan it right). So, I definitely got in plenty of steps today. After our visit to the zoo, we visited my grandmother. She hadn't seen Tristan in almost a year! She doesn't get out much (her vision is pretty poor) and we don't visit much (her home is filled with cigarette smoke - a lot of it - and Tristan has had respiratory issues in the past). My grandmother isn't looking too good and has issues getting around - out of breath just getting up and walking around, her feet are swollen (I couldn't tell because of the slippers she was wearing), and she's frailer than last time I saw her. Regardless, she's still hanging in there. Hopefully she can last another four weeks or so. Tristan feeding the giraffes. $1 for 3 crackers (a bit smaller than graham crackers). We had to spend $2 - he just wanted to keep feeding them! The Bungie Buddies exhibit. For $1 you can get a stick with some bird feed adhered to one end. With any luck, one of the dozens of birds would land on your stick and you can watch them feed up close. This one was our lucky bird! 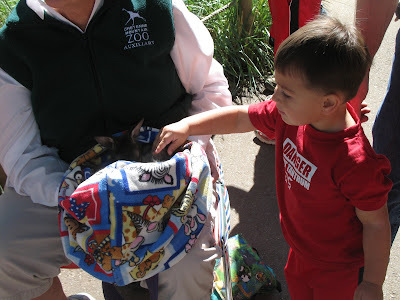 My little guy was so amazed by the gorillas (there was a baby gorilla, too). He got up on the ledge, laid out, and gazed at them. I couldn't get one good set-up picture with Tristan. 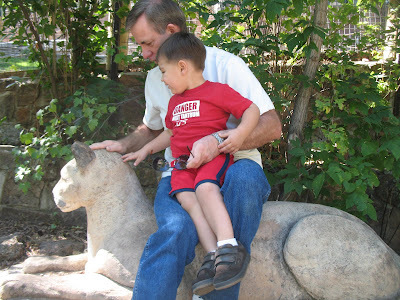 He was too into everything else around him to sit still and if Grandpa held onto him for too long, he would get upset and try to squirm out of his arms. This is about the best picture of him since he doesn't look upset. Tristan knew what this was as soon as he saw it! A "baby joey" he said. I wasn't sure if a baby wallaby is called the same as a baby kangaroo, so I asked the lady holding onto the little thing and she told me that they are both called a joey. Way to go, little guy! He's so intelligent!